Bayfield, Forest Lakes home sales expected to rise. As many of you know, the housing industry in LaPlata County has many well-known woes as well as a few surprises looking back on the past year's housing climate. Residential units for example, fell short of the predicted 5 percent increase for 2016. It is mostly attributed to the regulations that inhibit lot development. Residential construction, in general, was soft in 2016. 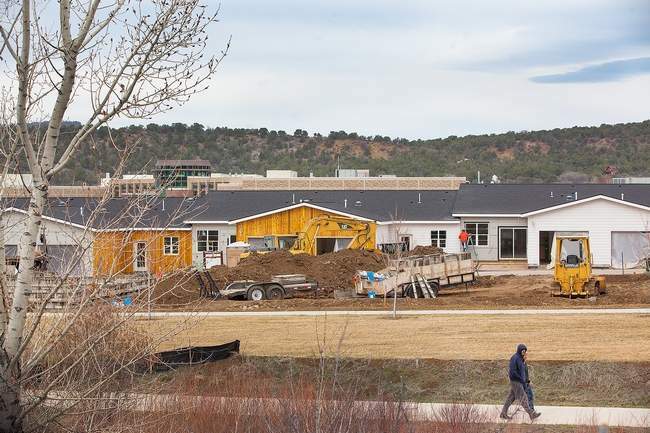 There were 27 single-family residential building permits pulled in Durango in the first eight months of 2016, a 37 percent decrease from the same time period on 2015. Rental rates did not increase, though the demand for housing was high. Alternative housing solutions, and policy that enables such construction, remains stagnant in LaPlata County. Tiny homes seem to be very popular today, and they were thought to be the hot commodity in our area. But, you see a few of them around but the question is, where are you going to put them? The construction defects law continues to deter condominium development, and that the city's fair-share ordinance, which requires developers to build a portion of their units affordable or else pay in-lieu fee. We would all like to see "workforce housing", and the lack of it, is the biggest threat. We are not sure how many homes and living units are delivered that are actually fair-share price product. Construction defect issues are still a statewide issue that impacts the affordability. Between 2001 and 2008, multi-family building permits comprised about 29 percent of the total, with an average of about 155 units per year. But from 2015 to 2016, those permits accounted for 18 percent of the total, or about 40 units per year. All of these factors contribute to an obvious and growing problem: Durango's housing stock cannot accommodate the number of people who want to live here. New multi-unit projects are on the horizon. Late last year, Durango City Council approved a plan for 194 apartment units at Escalante Drive near Wal-Mart. A smaller project underway at the corner of Florida Road and North College Drive is expected to be complete this fall and will add 20 units to the rental inventory. Another 50 rental units for Florida Road are under the City's review. In the buyer's market, activity at Three Springs is expected to thrive this year. According to Patrick Morrissey, Senior Vice President for the Southern Ute Growth Fund Real Estate Group, said they'll break ground this summer on a 70-unit apartment complex. The existing Confluence apratments reached capacity last year. He also said they are expecting 50 new homes starts and another restaurant to go in. Growth in Three Springs will continue to move forward. Migrants from elsewhere in Colorado are the top feeders to LaPlata County, followed by Texas, New Mexico, Arizona, California, Florida, Oklahoma, Illinois, New Jersey and Pennsylvania. In recent years Texas have outnumbered California migrants. In the mid-1990's, extreme earthquakes and fires brought a large influx of migrants from California. But in the past three years, Texas buyers have outpaced California buyers. The year ahead in real estate revolves around significant statistic that has challenged the local housing climate for years. From 2000 to 2010, the county's housing unit growth and household growth both increased at a rate of about 2 percent per year. But from 2010 to 2015, housing unit growth grew only about 0.87 percent per year, while household growth maintained its pace of 2 percent increase per year. We have inventory challenges here in Laplata County. Homes under $500,000 and lots under $100,000, and we continue to see the median price increase n the price of homes. Real estate agents predict an increase in home sales in 2017 in Forest Lakes, a community about 8 miles North of Bayfield and in Bayfield, because of their relative affordability compared to Durango. In-town residential real estate in Bayfield, however, has been an increasingly hot commodity, and the median price of those homes is expected to rise this year. Lodging occupancy is also strong, including at hotel alternatives such as VRBO and Airbnb. Two new hotels underway will also add beds to Durango. A number of factors could or will influence the market in the next couple of years including higher lumber costs; changes in the county and city comprehensive plans; the county's building code and land-use policy, both of which are under revision; and possible impact fees and use taxes, which could raise building costs.